In the autumn of 2015, the former mayor of London Boris Johnson announced an ambitious urban development plan for the British capital. The project (which in fact consists of two different but interrelated plans known as City in the East and City in the West) aims to create a more balanced distribution of economic and commercial power within the UK’s capital city. Over the past decade, development plans in West London have been somehow overlooked, since most of the work has been directed at transforming East London and getting this area ready for the Olympics. The City in the West Plan was created to address this situation and to help tap into the potential of West London and turn it into one of the most desirable places to live and work. City in the West is a joint initiative supported by the Greater London Authority, Transport for London, local councils in west and south west London, and various public and private sector investors. One of the key objectives of the City in the West plan is to consolidate a number of local planning and development projects, such as the Western Wedge or the Western Access Corridor. Other important objectives include the delivery of substantial infrastructure improvements, the creation of jobs, and the construction of quality and affordable housing. This plan could be considered as an ambitious extension of the London Plan. Whereas the 2004 London Plan contemplated the creation of 150,000 jobs in West London, the new plan sets its estimates at 300,000 jobs. Housing creation estimates have also been re-evaluated, going from 30,000 homes according to the 2004 plan to approximately 210,000. All in all, the Greater London Authority expects that more than 600,000 Londoners will directly or indirectly benefit from the new developments brought about by this plan. Wembley, where City in the West will build on the existing Wembley Masterplan and create 1,000 jobs and 11,500 new homes. The VNEB Area of Opportunity (which includes parts of Vauxhall, Nine Elms, and Battersea) will be one the main beneficiaries of City in the West thanks to the creation of 25,000 jobs and 20,000 homes. Edgware Road – Euston, where the estimates suggest that there is potential for the creation of 3,300 homes and more than 14,000 jobs. Hayes Town Centre will see the addition of 2,500 homes to its current housing inventory. In Southall, 3,000 jobs and 6,000 homes will be made available. White City, where 6,000 homes and 10,000 jobs will be created. Park Royal will see the addition of 10,000 jobs and 1,500 homes. Harrow Town Centre &amp; Wealdstone, where 3,000 jobs and 2,800 homes are set to be created. Hounslow Town Centre and Heathrow will benefit from the implementation of City in the West thanks to the creation of up to 12,000 jobs and 9,000 homes. In Feltham Town Centre, potential for housing growth has been estimated at 3,500 new homes. In Kingston, 13,000 jobs and 3,750 homes will be created. Approximately 5,000 homes will be built in Sutton, including parts of Carshalton and Hackbridge. Bromley Town Centre will benefit from the addition of 2,000 jobs and 2,500 housing units. In addition to the creation of 7,500 jobs and 7,300 new homes, Croydon has been earmarked to undergo important infrastructure improvements, which include a Tramlink extension and the extensive development of the Wimbledon – Croydon Brown Belt. Moreover, the City in the West plan includes several proposals that focus on delivering important transport infrastructure improvements. For example, one of the proposals that have already been approved entails the extension of the tube’s Northern Line from Battersea to Kennington. 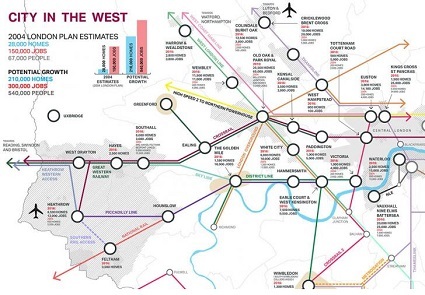 The plan also attempts to improve connectivity between the city’s main public transportation corridors, including Crossrail, Crossrail 2, and the High Speed 2 project. In summary, the joint implementation of the City in the East and City in the West projects has the potential to improve the quality of life of hundreds of thousands of Londoners and to create a strong east-west commerce and transportation axis in the British capital. Further information on business space opportunities in West London.